Smith-Gilbert Gardens is a premier metro Atlanta botanical garden and learning center located in Kennesaw. It is 16 acres of serene setting with more than 3,000 species of plant (several of which are rare in American gardens), 31 sculptures, and the historic Hiram Butler House (ca. 1880). 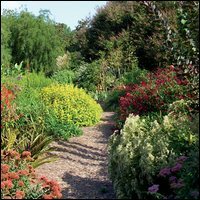 The Gardens offer educational programs for both children and adults and includes topics such as beekeeping, rock wall building, Bonsai gardening, caring for ferns, perennial flower beds, plein air painting classes and more.